Super cars built in a super plant. The Sindelfingen plant has just started the production of three new GTs: the Mercedes-AMG GT R, the GT Roadster and the GT C Roadster are handcrafted there. The Mercedes-AMG GT family, launched in September 2014, is the second model base after the SLS AMG, fully developed by Mercedes-AMG. 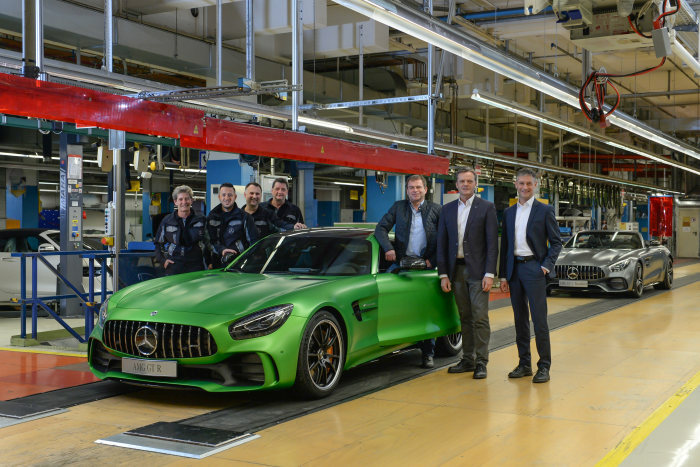 “With the new AMG GT R and the two roadster variants of the GT family, the production of these extraordinary vehicles has now started at the Mercedes-Benz plant in Sindelfingen. The team produces what has been completely self-developed in Affalterbach in an equally highly motivated manner and in top quality,” says Tobias Moers, CEO of Mercedes-AMG GmbH. All the AMG vehicles created in Sindelfingen are carried out entirely manually. The procedure begins once the body is removed from the paint shop. Lightweight parts like the carbon roof and the fabric roof are mounted with top precision by the experts. The attaching of the drive train to the car is romantically named “wedding”. It takes ten employees to bring together the preassembled individual components at the right time. Once the car and the drive train are “wedded”, they undergo dynamic test-drives at the plant’s in-house track. The Sindelfingen engineers keep in touch permanently with those in Affalterbach, the heardquarters of AMG. “With the production start of the three new AMG top athletes, the Sindelfingen plant is developing its competence in the high-performance segment of the upper and luxury class,” says Michael Bauer, Plant Manager of the Mercedes-Benz Sindelfingen plant. The Mercedes-AMG GT R is at the top of the sports car range bearing the AMG badge. Never before has AMG integrated as much motorsport technology into a series production model, powered by its high-performance V8 biturbo engine with 585 HP and featuring active aerodynamics. The youngest members of the AMG family, the GT Roadster and the GT C have rolled off the production line to bring the AMG-typical driving open air fun onto the road. The GT C makes use of 476 HP, while the top-of-the-range GT C runs with 557 HP under its powerdomed bonnet. The new models are set to hit the market this very spring.